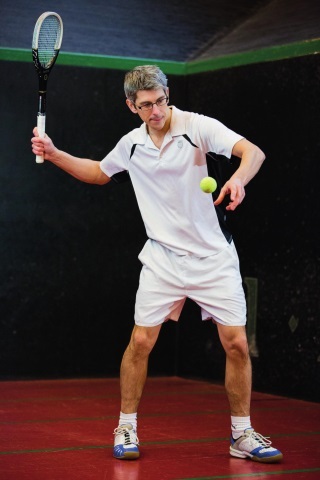 Nick started playing at Jesmond Dene Real Tennis Club in Newcastle upon Tyne at the age of 14. His first success came at 17 when he won the British Under-18 Championships as an amateur. The next day he joined the professional ranks, studying the game under the tutelage of former World Champion, Chris Ronaldson at the Royal Tennis Court, Hampton Court Palace. Nick carried on his successes through the age groups winning both the British Under-21’s and Under-24’s on three successive occasions. Nick broke in to the senior ranks by winning the 1998 European Open in Paris. In September 1998 Nick became the head professional at the Holyport Real Tennis Club and celebrated his new appointment by winning the inaugural Dresdner Kleinwort Benson Classic Singles and Doubles at the Royal Tennis Court. Nick and his then assistant Steve Virgona won the 1999 IRTPA National League for Holyport. The year 2000 was probably Nick’s most successful, winning the British Professional Championships, the US Professional Singles Championships, the Seacourt Silver Racket and reaching the final of the Australian Open Singles. In the 2002/03 season Nick defeated World Champion Rob Fahey en route to securing another Premier Division Title with new partner Andrew Lyons, and competed in the World Championships, losing to Tim Chisholm. Nick has proven himself to be one of the games greatest exponents, often described as a ‘classic player’. He is the favourite among the ‘purists’ and has won numerous Open doubles titles. Nick qualified for the World Championship in 2004 and 2006 but due to injury was unable to participate. In November 2005 Nick moved from Holyport to become the head professional at Petworth House Tennis Court where, ably supported by assistant Tom Durack, he reached the IRTPA National League final and once again beat the World Champion, although this time around the team were unable to lift the trophy. After two very happy years at Petworth, Nick returned to his real tennis home: the Royal Tennis Court at Hampton Court Palace. Recently, Nick has teamed up with Camden Riviere to win yet more doubles tournaments, including French and US Open titles.